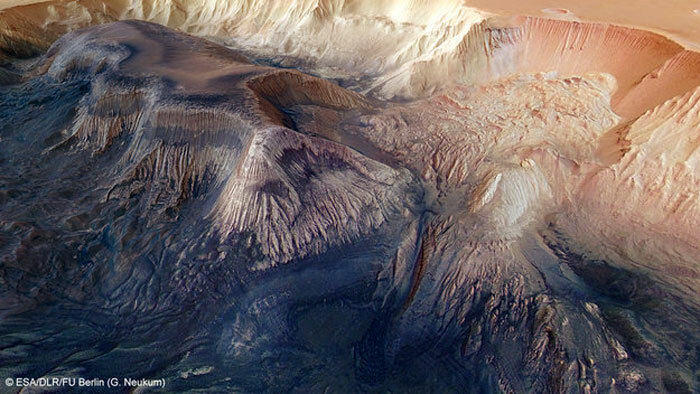 Ripped apart by tectonic forces, Hebes Chasma and its neighbouring network of canyons bear the scars of the Red Planet’s early history. 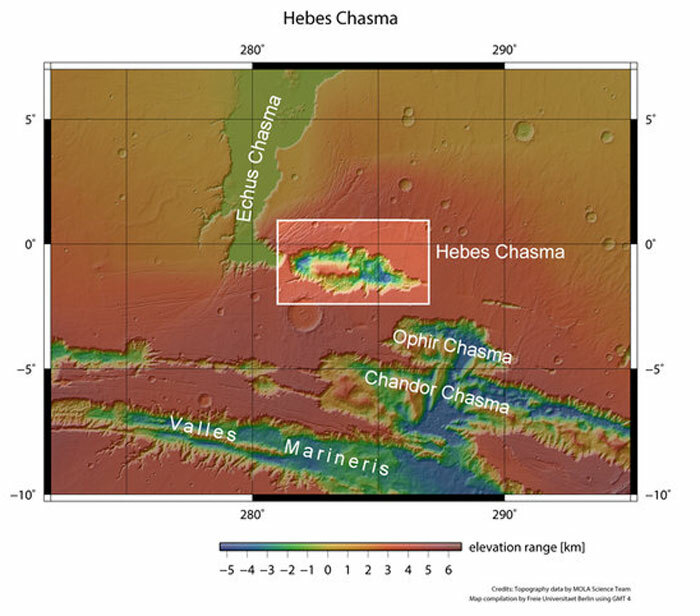 The origin of Hebes Chasma and neighbouring canyons is associated with the nearby volcanic Tharsis Region, home to the largest volcano in the Solar System, Olympus Mons. 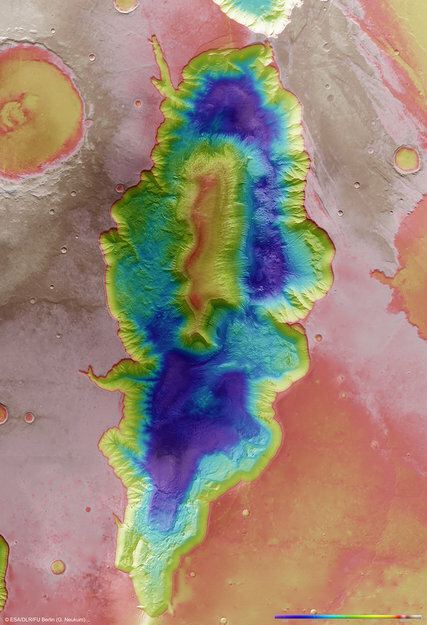 As the Tharsis bulge swelled with magma during the planet’s first billion years, the surrounding crust was stretched, eventually ripping apart and collapsing into gigantic troughs, including Hebes Chasma. Intricate fault patterns can be seen all around the deep depression – they are especially evident in the main colour and 3D images. 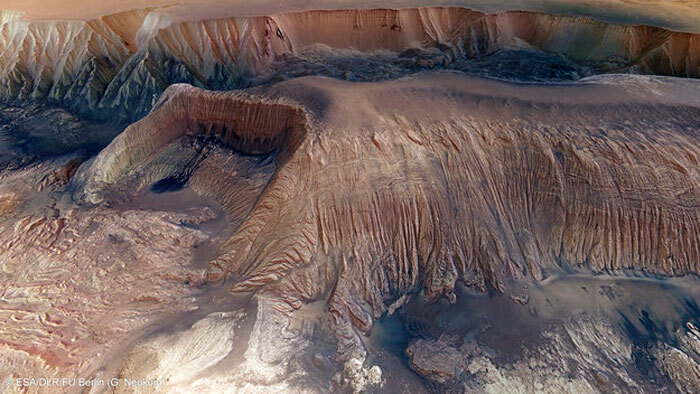 In the centre of Hebes Chasma, there is a flat-topped ‘mesa’ that rises to level similar to that of the surrounding plains. It is shown from different angles in the two perspective images below. A landslide may also be responsible for the dark patch in this image, which appears to pool like spilt ink across the debris. It is most likely loose dust that has slid down the walls, perhaps helped along where melting ice or ground-water weakened the rocks to create a flow-like feature. 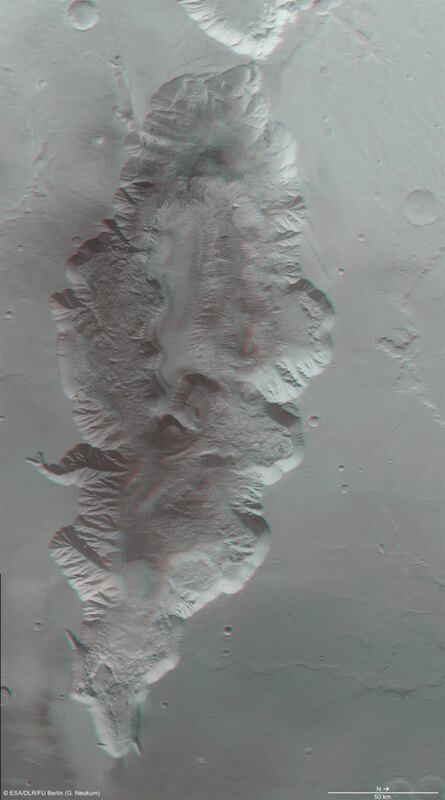 A similar feature is visible at the opposite end of the mound, as seen in the full-colour image. In the second perspective view above, a thin band of darker material is seen between two layers of light material. One idea is that the material was blown or slid from the top of the mound and collected on the slopes below. 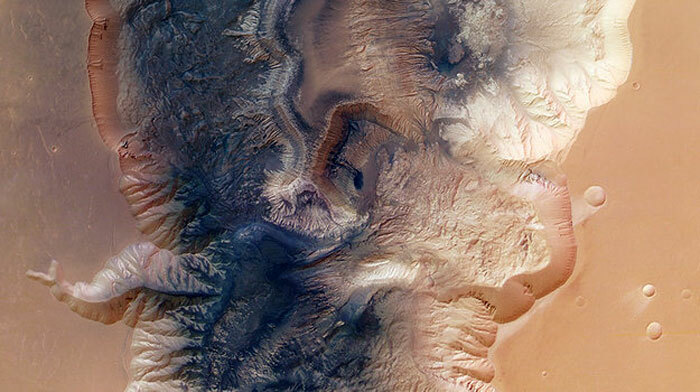 Dark material is also seen around the base of the mesa, which either eroded away from the younger sediment layers located higher up in the mesa, or were deposited separately by wind or water.